Their sail, while impressive in it's own right, represents something far greater for women. Watch this video, it's really quite moving! THE VOLVO OCEAN RACE started in Alicante, Spain back in October (2014). It stops in nine countries around the world before finishing in Gothenburg, Sweden this June of 2015. It's a long trip (9 months at sea!) and it's a tremendous challenge for these women, requiring massive teamwork and goal-setting. I can't even begin to wrap my brain around this journey but I can imagine it's life-changing for these women, and life-changing FOR US since they're paving the way! If you're wondering what SCA stands for like I was, it's a global hygeine and forest products company. They make everyday necessities like paper towels, toilet paper, tampons, tissues, diapers and more. The story behind SCA creating an all-female sailing team stems from the simple fact that most of their retail products are purchased by women. SCA wanted to honor their female consumers and make it possible for women to participate in an arena normally reserved for men. Team SCA was formed with a core of 8 accomplished female sailors "on board" and I got the chance to interview one of them! Her name is Dee Caffari. DEE CAFFARI joins the Team SCA crew from the United Kingdom and her position on deck is Trimmer/Pit Assist. She's no stranger to ocean racing or setting speed records. She's the only woman to have sailed solo around the world in both directions (east about and west about), as well as being the only female to have sailed around the world three times, nonstop. Check out Dee's answers to my dying questions and keep reading to find out how you can nominate an amazing women in your life with the help of Team SCA. What kind of physical training is required to sail on the Team SCA yacht? DEE: We have followed a strict training program over the last 18 months to ensure we are fit enough for this race. We have focused on core strength to prevent any risk of injury and maintained a cardio base throughout. The main training has concentrated on strength, though, and we have all managed to increase our personal bests in terms of weight lifted. Since the beginning of the race, it has been all about maintenance and recovery at each stopover to ensure we are rested and ready to go again. What is mentally and then physically empowering about sailing? DEE: No two days are ever the same out on the water. For me, I think you are always learning when on the water, and the day you stop learning is the day you should stop sailing. To sail well you are constantly processing information – wind data, boat information and the feel of the boat as it sails. This is mentally tiring and can be quite a challenge in difficult situations. But to have everything come together and feel the boat sailing well is so rewarding. Physically the boats are tough to sail. They require lots of effort to hoist and trim the sails, but to get the crew working together as a team feels good and when we change sails efficiently it almost feels easy, that is when it becomes rewarding. What can’t you live without when you’re out on the ocean? DEE: I think the answer here has to be sunscreen. We are facing the elements all the time and this takes its toll on your skin. Protection is necessary as the salt water constantly hits your skin and the severe heat and the severe cold all have an effect. What else improves your performance and time at sea? DEE: Technical clothing – the advances of clothing has meant that sailing fast offshore is now more enjoyable. You are drier and warmer than before, so you can focus your energies on making the boat go fast. Communications – satellite communications now mean that you can stay in touch with the outside world so easily, and it means we can share our adventure with everyone easily, too. This is good for your sanity as it nice to hear news from home and it makes you feel like you haven’t been forgotten even when you are out in the middle of the ocean. The messages of support the team receive are often overwhelming and it helps put things in perspective when things are tough. Fresh water – we use a desalinator when offshore that converts the sea water into fresh water by means of high pressures and filters. This is essential as all our food is freeze dried and needs water to enable us to eat it. We also try to consume between 3 and 5 litres of water a day depending on how hot it is. The other thing I cannot live without are decent sunglasses as the glare from the water is intense. I never go sailing without them and we have been supported by Julbo for this project so our eyes have had great protection. Are you ever frightened by the world beneath the water? Sharks? Rough waters? Or maybe just the unknown? DEE: I am a qualified dive master, so I do not fear the underwater world but am fascinated by it. It is exciting to see nature in its natural environment, and, when we are sailing, we often see amazing sights from pods of dolphins to sharks and whales. Flying fish always mean you are in the tropics, so I consider them a good sign even though they smell bad when they land on deck. Did you set out to claim the record of being the "only woman to have sailed solo around the world in both directions” or did someone else inspire you to do this? DEE: Sir Chay Blyth was the first man to sail westabout the globe and he encouraged me to follow in his footsteps and become the first woman to do it. During this trip, I wanted to sail around the world the right way, and, therefore, sail with and against the best sailors in the world. The fact that this gave me a unique title of being the only woman to sail solo and non-stop around the world in both directions was a bonus. For me it was about taking opportunities as they arose rather than seeking a title. I guess, as a result, I have seen a lot more ocean than others have. When you're offshore, does the rocking of the sea ever bother you? DEE: It is almost normal for me to be offshore. I am very happy in the environment and do not notice the changes or the rocking. Some conditions are more comfortable than others, but the bad stuff never lasts for long. How does someone who wants to be a professional sailor and on a team someday get started? DEE: Sail as many miles as possible with as many different people on as many different boats as possible. This way you are constantly learning and you pick up good and bad tips from everyone. This experience is invaluable and will put you in a good place to try for a team. Be prepared to listen and try new things and always trust your instincts. Dee is AMAZING! Meet the rest of the Team SCA squad in this video RIGHT HERE. They're women just like you and me...which means you could sail around the world too! Think about it! TO NOMINATE an amazing women that has affected your life and could inspire many others, go to Team SCA's PHOTO MOSAIC. 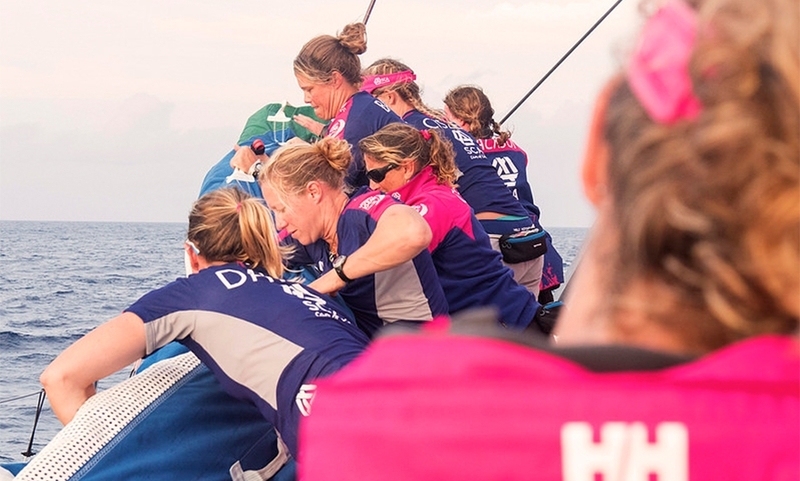 Bringing amazing women to the world's attention is what Team SCA is all about. We're unstoppable and need to support each other as we take on huge endeavors and change the world in our own unique ways. Here's one last video that goes into that a little more. TELL ME who you plan on nominating! Share your amazing woman in the comments section below. I'm going to nominate one of my best friends and of course, my mother! SCA believes that everyone should have the opportunity to live life to the fullest, and we are committed to creating value for people and nature. To champion these ideals, SCA launches Amazing Women Everywhere, to celebrate women who have a positive impact on others. The women of SCA's all-female racing team, Team SCA, exemplify this spirit. They have come from all walks of life and backgrounds to take on one of the world's most challenging endeavors, the Volvo Ocean Race. For nine months, their journey of hard work and determination will inspire millions around the world. Follow along with Team SCA on Facebook! We aim to gather thousands of stories from all over the world and inspire thousands more by illustrating that amazing women truly are everywhere. Visit http://www.teamsca.com/awemosaic to submit a photo of an amazing woman in your life. This is a sponsored conversation written by me on behalf of SCA. The opinions and text are all mine.